Last year a trio of memoirs were published, written by real teen girls about their experiences. They were Marni , Chelsey , and Emily , and are about a wide assortment of issues. 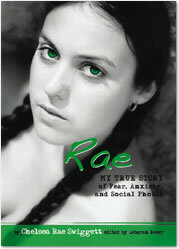 This year, three more will published, and among them is Rae , a memoir by fellow book blogger Chelsea from The Page Flipper! Here is more about the authors of this year's set of books! Alexis Singer is from Pittsburgh, Pennsylvania. At 19, she is about to begin her junior year at Chatham University where she studies political science and women’s studies. She attended the Pittsburgh High School for Creative and Performing Arts as a writer. She is a writer, a read, an activist, a feminist, and an avid home cook. Her heroes include Alice Paul, Conan O’Brian, and her mother. 18-year-old Hannah Westberg lives in Vancouver, Washington. She earned her GED and plans to enroll in Portland Community College’s drug and alcohol counselor certification program. When she’s not babysitting, she is probably volunteering for political and charity organizations, as well as participating in flash mobs. Chelsea Rae Swiggett is 18 years old and lives in Ohio. She will soon be heading to college to major in English and immerse herself even further into the world of books and writing. She currently serves on the Ypulse Youth Advisory Board and plans on traveling the world—or at least the US—by the time 2012 hits. Just in case. Visit her on her YA book review blog, The Page Flipper.